Fitbit trackers spend more time on our person than pretty much any other wearable item - so cleaning them every now and then is an absolute must. With sleep tracking now integral to the company's entire crop of devices, and waterproofing now resulting in us taking them in the pool and shower, the only time many of us take one off is when it's running low on battery. And, let's be real, anything that spends that much time on your body needs cleaning. But it isn’t just about personal hygiene, as not washing your Fitbit can also become a skincare issue. Plus, taking care will prolong the lives of your Versa, Charge, Inspire, Ionic and Ace trackers and accessories. Here’s how to clean your Fitbit tracker and band. In order to keep your Fitbit smartwatch or fitness tracker in working shape, you’ll need to keep those charging pins in tip-top shape. They're all located in slightly different places, depending on which tracker you're donning, but they're always the gold dots at the point that meets the charger. How do you do this? Well, the company recommends occasionally using a toothbrush and some rubbing alcohol to keep the charging pins on your watch or tracker gold or bronze coloured. And it's also worth giving the charging pins the same courtesy with a cotton swab and a little rubbing alcohol, ensuring no pieces of swab remain in the pins. Don't forget about the pins, either. If you have lint within the tiny holes that fit into the band's entry points, you could struggle to switch between them, so perform the same practice as above to keep them clean. The elastomer bands are the silicone-y ones that are generally shipped as the standard option, like with the Fitbit Charge 3 or the new Versa Lite Edition smartwatch. These, as well as the Fitbit Ace 2, Flex 2, Ionic and Inspire trackers, are all waterproof and can be worn in water, and these bands are equipped to deal with that. The flexible polymer is highly durable and designed for intense training, but you’ll need to clean them to keep hygiene up and irritation down. Clean regularly: Fitbit wants you to regularly rinse both your band and your wrist after your workouts. It suggests using only water or soap-free cleansers (like Cetaphil, Gentle Skin Cleanser, or Aquanil) on the band. It advises against using any soaps or cleansers that could get trapped beneath the band and potentially irritate your skin. Obviously, you’ll also need to dry the band thoroughly before putting it back on. Oils and lotions: If you’ve been wearing sunscreen or body lotions that may rub off on band, Fitbit recommends using soap-free cleansers and drying the band. Stubborn spots: If you notice some stains, steer clear of those soaps. Fitbit says you can go at it with a wet toothbrush, but that’s your lot. Some users have recommended using a magic eraser – akin to those you’d use to wash down walls – if all else fails. Just remember to rinse it well after you're done. 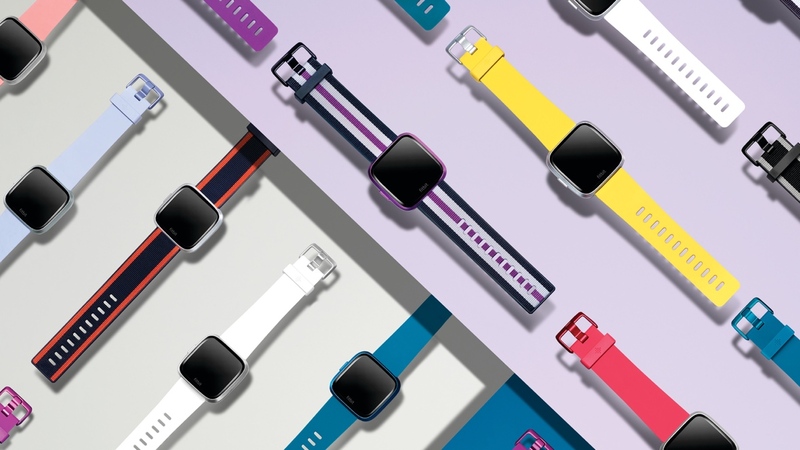 Need a new Fitbit band? For some of its products, Fitbit offers a leather band as an upgrade for when you want to feel a little fancier. Designed for show and not for go, these bands won’t withstand workouts and don’t deal with sweat or water - trust us, we've made the mistake of trying. However, like any watch strap, it’ll still get grubby from general use. Fitbit recommends a 'non-abrasive lint-free cloth', which can be lightly dampened with water. Then, it’s important to let it air dry indoors at room temperature before putting it back on. High temperatures and direct sunlight will leave it damaged and discoloured. It’s a similar story for the metal bands, like the sleek stainless steel option available for the Versa smartwatches. They aren’t water or sweat resistant, so, whatever you do, don’t soak them. They should only be cleaned with a non-abrasive lint-free cloth, which you can dampen if necessary. Dry it well with a second cloth before putting it back on. Again, these bands are no fans of direct sunlight or high temperatures. Ah, the ‘athleisure’ choices. While still not designed for intense workouts, Fitbit does allow you to hand wash its own Woven bands, as well as the fashion-centric PH5 knit bands for the Versa collection. You can rinse them in a little cold water with a mild soap, as long as you rinse them properly and air-dry them after. Putting them out in the sun to dry could lead to discolouration and damage. These breathable, perforated bands are made from silicone. Fitbit doesn’t provide any specific instructions for cleaning these bands, but advises following the same instructions the company gives for elastomer bands. That means regular rinsing, and soap-free cleaners like Cetaphil, Gentle Skin Cleanser, or Aquanil.